Exercise and changes in movement, such as "slowing down"
Canine nutrition is extremely important throughout the entirety of a dog's life. However, making sound senior dog food choices is an especially important facet of senior dog care. Because of decreased physical activity and slowed metabolism, aging dogs may need 20% fewer total calories than middle-aged adult dogs. However, some older dogs may not be able to assimilate proteins as well when they were younger and may require additions in protein or change in the type of protein to maintain adequate nutrition. Generally, aging dogs tend to gain weight, and as they do, senior dogs become at risk for possible health complications that did not plague them in adolescence. For example, it may take obese dogs longer for their blood glucose concentrations to return to normal. This disrupted carbohydrate metabolism can lead to diabetes. This is why it is important to consult your veterinarian about the best senior dog food option for your canine companion. Specially formulated senior dog food is easier to digest, may also address liver, kidney or urinary issues, as well as the general nutritional needs specific to senior dogs. 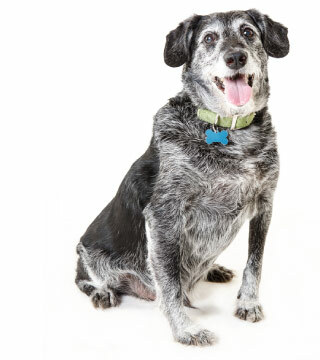 In general, senior dogs tolerate vaccinations similar to younger dogs. Nonetheless, we evaluate each dog individually when deciding upon a vaccine protocol. Because vaccination schedules are unique to every dog, we recommend discussing vaccinations with your veterinarian to choose the options that are right for your elderly canine companion. Senior pets are as vulnerable to parasites as younger dogs and in some cases even more so. Unfortunately, they may not be able to groom and care for themselves as well as they once could and therefore may not show clear signs of distress when infected by fleas, ticks and blood parasites. Therefore, it is very important to maintain consistency with flea/tick and intestinal parasite control programs for aging dogs. Your veterinarian can help determine if any changes should be made to an existing senior dog care parasite control program, as well as if a program should be implemented or terminated altogether.